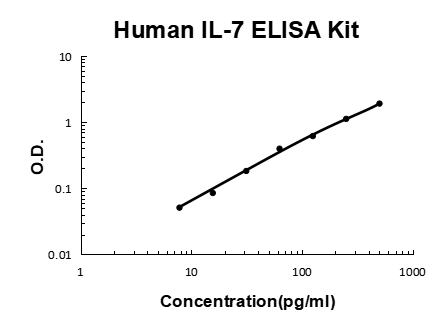 Sandwich High Sensitivity ELISA kit for Quantitative Detection of Human IL-7. 96wells/kit, with removable strips. Hematopoietic growth factor capable of stimulating the proliferation of lymphoid progenitors. It is important for proliferation during certain stages of B-cell maturation. .
IL-7 a hematopoietic growth factor secreted by stromal cells in the red marrow and thymus. It is also produced by keratinocytes,1 dendritic cells,2 hepatocytes,3 neurons, and endothelial cells4. Interleukin 7(IL7) is a protein5 that in humans is encoded by the IL7 gene.6, 7, 8Knockout studies in mice suggested that this cytokine plays an essential role in lymphoid cell survival.9 IL-7 is a cytokine important for B and T cell development. This cytokine and the hepatocyte growth factor(HGF) form a heterodimer that functions as a pre-pro-B cell growth-stimulating factor. This cytokine is found to be a cofactor for V(D)J rearrangement of the T cell receptor beta(TCRB) during early T cell development.